I (Evander) have waxed perhaps not-so-poetic(ly) on May 22 as the upcoming jubilee of the home run Mickey Mantle nearly launched out of old Yankee Stadium. Some estimates have the ball traveling something like 730 feet. More realistically its distance, had the roof of the upper deck not got in the way, would be 200 feet fewer. My cousin, who was listening on the radio late, says Phil Rizzuto, announcing (though Mel Allen had probably re-created the moment for posterity), almost fell out of the press box. We repeat, mere power is not our thing at Right Off the Bat Project. But momentous is momentous; monumental is monumental. Therefore today, let us celebrate the anniversary of the very first ball Mantle almost propelled out of the Stadium during the course of a game: May 5, 1956. * Comic Billy Crystal has always claimed to have been among the 12,773 spectators that Saturday afternoon—I believe he says it was his first ballgame. The box score can be found here. The frieze-striking blast was served up by one Moe Burtschy. Note Don Larsen, who would throw a perfect game in that year’s World Series, before a lot more fans (64,519 to be exact), came in to relieve. Mantle would win the Triple Crown during the regular season. Billy Martin batted just ahead of Mantle, and had not yet been traded to the opposing team, the Kansas City Athletics, as punishment (in part) for his participation in the infamous Copacabana brawl. The ugly incident at the nightclub would take place almost exactly one year later. Back to our own time, I understand that the U.S. (or perhaps North American) cricket season opens on Cinco de Mayo, 2013. I’m not sure how much cricket is actually played in Mexico or France. 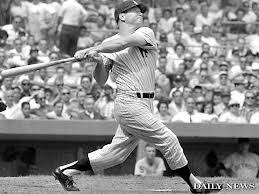 * In early May, Mantle had 11 home runs and was batting an otherworldly .446. In mid-August, he was still hitting .376. Nineteen-fifty-six was one of the all-time great single-season offensive performances. This entry was posted in Baseball, Cricket, Right Off the Bat Book, Right Off the Bat Website, Yankees and tagged Billy Martin, Don Larsen, Kansas City Athletics, Mel Allen, Mickey Mantle, Moe Burtschy, Phil Rizzuto, Triple Crown, World Series, Yankee Stadium. Bookmark the permalink.